How it works: The composting basket is key to adding nutrients to your garden bed. It's here you can continually use up your regular kitchen scraps to nourish your keyhole garden. For best composting success use the Brown-Green alternating technique (see our PDF below: The Secrets To Expert Composting) as this helps your compost work the best. The composting basket sits at the top of the Cascading Garden and extends to the very bottom, supplying nutrients to each garden bed. Your kitchen waste will be put to good use as it breaks down, feeding your vegetables and flowers with top-notch fertilizer. 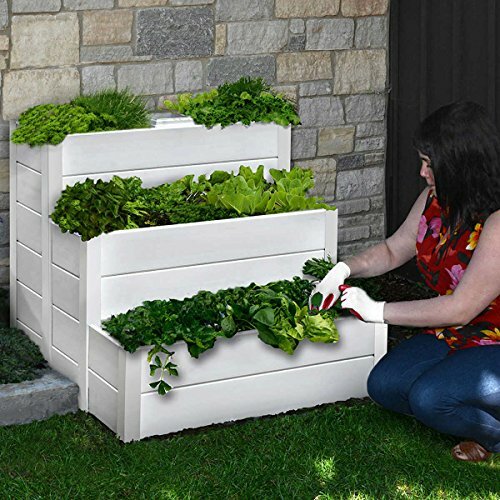 Create your own fertile garden soil and reduce your kitchen waste in one move! The Cascading Keyhole naturally controls weeds and reduces damage from rodents! A byproduct of its unique design is increased air circulation--and your plants will be healthier because of it! Garden + Compost = Genius.